The Insect Collector Shop warrants that the Goods provided are of quality and will be sold on an “as-is” basis. The Insect Collector Shop warrants that all Goods will be handled with care but does not guarantee that the Goods supplied are without flaws or minor imperfections. The Buyer agrees to comply with and respect the terms and conditions regarding the pricing, payment and shipping. The Insect Collector Shop will process the orders on a first come first served basis. Under the Data Protection Act (DPA), both parties warrant that they will not disclose any information to a third party and will respect the fundamental rights and freedoms particular to their right to privacy and that they will comply in the collecting, processing and use of personal data. The sale taxes are not included in the prices. They will be applied to the invoices on goods purchased in Canada and will be based on the province of residency. No sales taxes are applied if you reside outside of Canada. The Buyer must ensure to provide the correct mailing address in order for the Seller to fulfill the obligation to deliver the Goods at his premises. The Buyer will accede to all costs and risks involved in the delivery of the goods from the Seller’s premises to the final destination. The Insect Collector Shop is not responsible for the rights, taxation and costs of handling imposed by customs on the goods that are shipped to you. All Goods is guaranteed with the exception of damage due to postal shock. The Goods may be returned within 14 working days from receipt of the order and must be in a saleable condition or the Seller reserves the right to refuse the refund or credit. The Buyer will be responsible for the cost and risk of loss or damage when returning the Goods to the Seller’s premises. The Seller will refund the Buyer either monetary or by credit for the value of the Good that is unsatisfactory. The insects that are sold are specimen of top quality that are dead, dried, papered and are ready to be re-hydrated and mounted. The photos displayed in the catalogue represent the butterflies and insects for sale and are not the actual photos of these specimens. 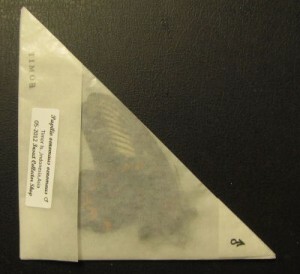 The following photos identify the manner in which the butterflies and insects are packaged along with the tool (calliper) that I use to measure the insects. The suppliers remove the abdomen of most species of Morphos because they will retain fat from when they were in their larvae state. If the abdomen is not removed then this fat will leak and discolour the wings. Therefore, if you should order a Morpho butterfly and notice that it does not have an abdomen, this is the reason why, (sorry we don’t have the body in stock). The females do not have this problem. The suppliers remove the abdomen of certain species, particularly the male and will send them separately because they discharge oil on the wings. If this is the case, soak the abdomen in acetone for about an hour or so, then air dry it. You may re-attach the abdomen to the specimen with the use of any ordinary white glue. This will prevent the discoloration of the wings. The females seldom have this problem. 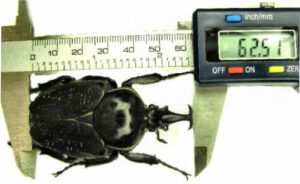 In remaining with the CITES goal in maintaining the international agreement between governments, all insects identified in the catalogue are imported legally into Canada and are accompanied with an export permit from the country of origin. As of February 2012, The Canadian Wildlife Service has changed the CITES re-export permit procedure from Canada. Permits can no longer be obtained locally. They are now issued out of a central location near Ottawa. This process is now much slower and the timeframe to obtain a permit can be between 6- 8 weeks. Due to the complexity of this new procedure, I have decided to sell the endangered species to Canadian customers only because no permit is required. A1 As perfect as can be. Some are ex-pupae bred. As perfect as can be. 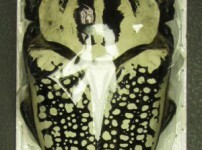 A1/A1- Very good quality with possible minor imperfections or broken antennae. Very good quality with possible minor imperfections or broken leg. A1- Good quality with larger imperfections. Good quality with larger imperfections. A1-/A2 Good quality. Easily repairable. Good quality .Easy repairable. A2 Second quality. Far from perfect. Second quality. Far from perfect. 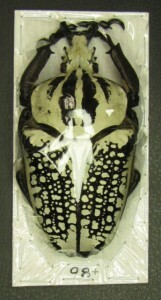 Please note that A1 quality is somewhat difficult to obtain for certain insect groups of countries such as Africa and China due to their handling and shipping. A1 As perfect as can be with possible minor imperfections. As perfect as can be with minor imperfections. A1- Very good quality with larger imperfections. Broken or missing one antenna. Very good quality with larger imperfections. Possible small pieces missing. * The endangered species (CITES)are sold to Canadian customers only.